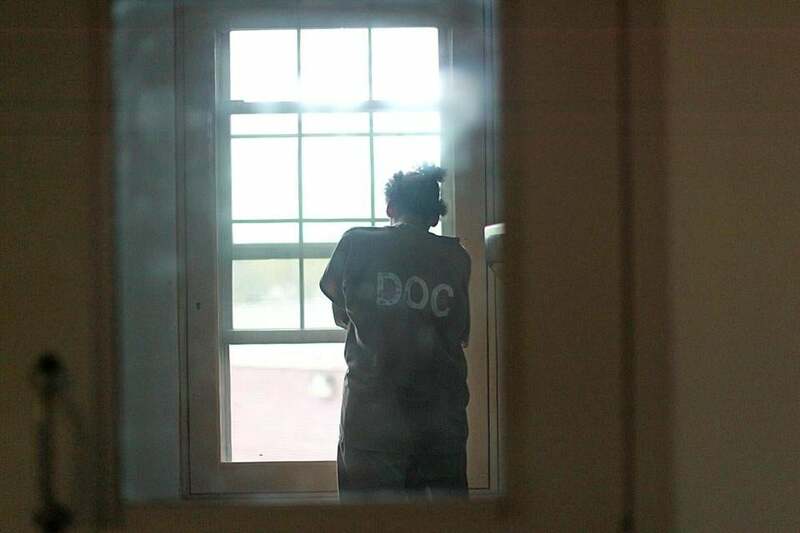 An inmate in her cell at MCI Framingham’s Intensive Treatment Unit for inmates with mental health issues. Drug sentences and the age of criminal responsibility have dominated the debate about the criminal justice bill making its way through Beacon Hill, but the sweeping legislation also targets a largely overlooked aspect of the system: the treatment of people with mental illness in courts and prisons. Lawmakers are calling for expanded programs to divert mentally ill people from jail, stronger oversight of solitary confinement policies, and more training to help police officers deescalate confrontations with those who have mental illness. Legislators also plan to study establishing a crisis center in Middlesex County where police officers and other first responders from that region could bring people in psychiatric or drug-induced distress. The proposals, set forth in separate bills passed by the state House and Senate, are drawing measured praise from advocates for those with mental illness who have long called for reforms. Many described the provisions under consideration as positive steps but said they don’t go far enough in addressing the full scope of the problem. The legislation includes policy changes meant to address some of the tragic consequences documented last year by the Globe Spotlight team, which focused on the state’s failure to build a comprehensive mental health care system to replace the network of psychiatric hospitals that began closing in the early 1970s. The Globe series documented how people with serious mental illness often wind up in homeless shelters or prison instead of receiving psychiatric care. In the coming weeks, negotiating committees appointed by the House and Senate will try to reconcile differences between the two bills and send a compromise measure to Governor Charlie Baker. It is unclear which provisions that address mental health will ultimately become law, but both bills call for stronger oversight of solitary confinement, a controversial punishment that has come under increasing scrutiny for its harmful impact on the mental health of inmates. Both versions would create committees that would review who is being placed in segregation, for how long, and the impact on inmates’ well-being and recidivism. The House bill calls for two independent panels to review segregation practices, one that would include a Department of Correction official, a retired judge, a representative of Prisoners’ Legal Services, a group that advocates for state prison inmates, and an official from the Massachusetts Association for Mental Health. The Senate bill, by contrast, proposes an internal panel that would consist of two officials from the Department of Correction and a clinician working in the prison. Critics fear the Senate’s proposed board would lack the independence to be as objective. State Senator William Brownsberger, sponsor of the Senate’s criminal justice legislation, said the bill requires the Department of Correction to report the number of inmates placed in solitary confinement, including their race, age, and disciplinary history. “We think we have a very strong information disclosure requirement, so it will be very feasible for agencies both public and private to have a clear window into what’s happening,” Brownsberger said. Leslie Walker, executive director of Prisoners’ Legal Services, said she was disappointed that other proposals to curb the use of solitary confinement failed. They included an amendment that would have given inmates in solitary, who currently spend 23 hours a day in segregation, two additional hours outside their cell to take part in programs. Mental health advocates said they were pleased by the Senate bill requirement that police training include handling complaints that involve people with mental illness. But they noted many police departments are already training officers in such techniques. What is missing is a place where officers and first responders can take someone who is in the throes of a crisis, said June Binney, director of the Criminal Justice Diversion Project at the National Alliance on Mental Illness of Massachusetts. Binney said the solution is a center with staff who are trusted by police and can take care of people in crisis. Such centers have been running in cities like San Antonio for years. The Senate legislation would set aside $250,000 for a pilot program to explore a similar facility. Over the next four years, a commission that would be chaired by Middlesex Sheriff Peter J. Koutoujian and a representative from the Massachusetts Association for Mental Health would be charged with how to establish the center. Its creation is crucial to the state’s central goal — diverting people with mental illness from courts and jails, Koutoujian said.